Oocysts are produced non-sporulated but will sporulate in about 2 days. They are about 10×10 µm and millions can be produced within days. Cats can develop strong immunity to this stage. Tachyzoites have a fondness for neural and cardiac tissue but can infect any nucleated cell in the body. This is the stage that crosses into the placenta and causes congenital infections. Rapid division of tachyzoites is what causes tissue destruction, the spread of infection and lesions. Bradyzoites (“brady” = slow) are responsible for tissue cysts. They can be present in any organ and survive for the life of the infected animal since they are resistant to the drugs used to treat Toxoplasmosis. If the host is immunocompromised, infection can be reactivated and intermediate hosts can infect one another. Bradyzoites are at fault for initiating meat induced infection, on top of being the only stage to give rise to entero-epithelial stages. Once again, the etero-epithelial stages are only found in cats. There are 5 types of entero-epithelial schizonts (which will not be listed). This is where the sexual stages/oocysts are produced. 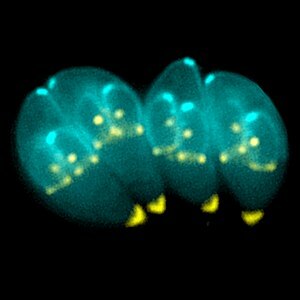 Overall, Toxoplasma gondii was the most successful parasite discussed in my Intro Parasitology course. Before I dive into aspects about the parasites mentioned in my last post (Trichinella and Toxoplasma gondii), I thought it would be a good idea to post a few definitions of frequently used terms. For future parasite posts, I’ll be sure to try to include a link here to make it easy on new readers, or just in case you’ve forgotten. We’ve all gotten the cutesy side of pigs in the media from shows like Winnie the Pooh and his pal Piglet. People also have pigs as pets, not just in a farm environment. 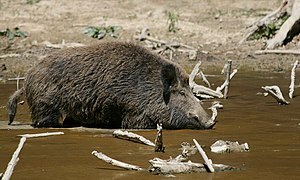 Over the years, domestic pigs have escaped their confines leading to feral pigs, also known as wild hogs, wild boars, and razorbacks, among other names. After being introduced to the U.S. by Europe in the 1500s, Sus scrofa hasn’t stuck strictly to captivity. “Within two generations out of captivity, domestic pigs usually lose their pink hue and turn striped and coarse-haired, DePerno said, allowing them to blend in with feral populations” (NG). According to studies, 39 states harbor an estimated 4 million wild pigs. The hogs can be aggressive both with humans and the environment. Rooting can damage local flora thereby affecting the surrounding fauna and with tusks, usually 3-5″, that have been recorded up to 9″, hogs can easily injure a human. (WDNR) Aside from the dangers their activity poses to agriculture, the environment and humans from physical injuries alone, they also may bring parasites back into the domestic population. The two main parasites of concern are Toxoplasma gondii and Trichinella (which I will address in a later post or two). The parasites can spread through consumption of the meat and can make its way back into domestic populations should the feral pigs come into contact with free range pigs. The consensus seems to be an aggressive approach to eradicating the razorback issue.